Driving to the picturesque village of Piodão is a scenic adventure full of hairpin bends and narrow roads that snake through the mountains. On clear days, the views are spectacular. The terraced fields and stone walls of low-lying arable land contrast with the barren heights of the Serra do Açor. Eventually, you’ll arrive at a picture postcard cluster of tightly packed stone cottages presiding over a gurgling river. Bar the incongruous white church, the entire village of Piodão is made of almost entirely of schist, including the roads and paths between houses. I’m surprised it isn’t integrated into the network of schist villages in central Portugal and can only assume that the Historical Villages network claimed it first. The compact dwellings are built from chunks of rusty brown stone and capped with overlapping sheets of grey slate. If you ignore the bright blue paint around the windows and on the doors, it doesn’t take much imagination to step back a couple of hundred years in time. Sounds like a place you’d like to stay in? Check out these accommodation picks. As you wander around Piodão village, look out for the wooden crosses nailed above doorways. They’re made from bay tree wood that has been blessed to ward off evil spirits. Other interesting features to look out for include tiny chapels, the communal bread oven and the eira, a communal space for drying crops. All but abandoned a couple of decades ago, this remote settlement still depends on small scale agriculture supported by the much needed boost that tourism has brought. The local cheese is wonderfully soft and tangy and perfect in a cheese and presunto sandwich. If you want to buy sheepskin products, cheese, honey or slate-based souvenirs, you’ll find plenty here, alongside chestnut cakes and local liqueurs. In the summer, Piodão’s river beach provides a perfect opportunity to cool off and while away a few hours. It has a café and a proper pool ensconced in schist paving. Alternatively, you could appreciate the landscape by doing one of the short walks originating in Piodão. Ideally in better weather than when I went! Despite the fine rain and hanging mist, Mike and I set off through the eucalyptus forest towards the even smaller village of Foz d’Egua. I’d seen photos of its bridges and was determined to visit. Along the path we encountered the ruins of abandoned hamlets and lightening-struck trees before entering the fairy tale village of Foz d’Egua. After taking the obligatory photos of the three-way schist bridge, we took a deep breath and ventured across the swaying wooden suspension bridge. Slightly scary but worth doing. You really need a car to get to Piodão. Check out this article about hiring a car in Portugal if you haven’t got one sorted out yet. If you fancy staying overnight, there are rooms for rent in a couple of the stone cottages in Piodão village itself or you could overlook the fact that the nearby INATEL hotel looks a bit like a prison if you want more extensive facilities. 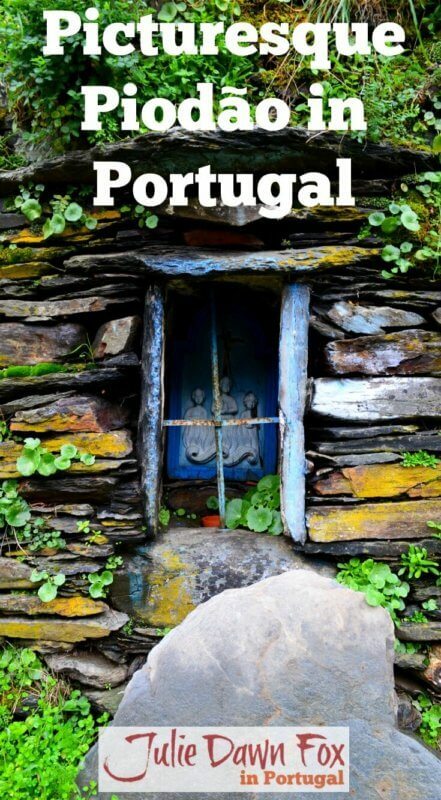 InXisto is in Chãs d’Egua, one of the places you can walk to from Piodão, and consists of two modern schist cottages where you can cook your own meals and make friends with foxes! Charming Quinta da Geia offers both rooms and self-catering apartments and has an onsite pool and restaurant. Quinta da Moenda is a converted watermill on the edge of the river with its own pool and self-catering accommodation. Casa do Secolinho provides bed and breakfast in a rustic setting. The mountain schist villages are, indeed, wonderful places to visit. We actually took a tour of several in the Gois region with a guide, Alexandra, who works for Transerrano. For folks who are interested, I would really recommend Transerrano (we also did a really fun rafting day trip with them down the Mondego River). Anyway, Alexandra was great because her family is actually from Aigra Nova, so she was able to really describe well what it was like (and still is, for some) to live there. I may not have understood her totally correctly, but I’m pretty sure she said that Piodao is composed primarily of a stone that is not schist. Maybe granite? So perhaps this is why it’s not part of the official network. Hi, thanks for the extra info and the thoughts on the stones used in Piodão. It certainly looks like schist but I’m no expert on the different types of stone. We’re very fond of Piodão and all that region, although forest fires can devastate it from time to time. We also like Quinta da Geia very much – friendly people and great food! A visitor from Scotland thought it was the nicest place he had ever stayed in. Thanks for that, Robert. I’m looking forward to my next visit to that area. I’m sure they’d have plenty of stories to tell. It must have been a hard life indeed before the roads were improved. Piodao is beautiful, I used to take all my overseas visitors there, as it was about 60kms from our place. Enjoyed seeing your pictures Julie. I bet they loved it. It’s quite a drive but well worth the effort. Enjoyed the walk with you through enchanting Piodao through mist and mistry, foxes and folks, suspension bridges and all…..